I am so very, very lucky to have great internet friends!! I can’t thank all of you enough for visiting, commenting, wrapping me in love, support, humor and friendship. That being said, I want to also thank many of them for sending me links that make me laugh and make me think. This one, from my friend Chris, really touched a chord. Please, if you have a minute, take the time to read this story from Chicken Soup for the Teacher’s Soul. It's written by Diane Miller, and it’s worth it. The telephone rang. It was my sister. She said, "Just thought I'd let you know I used your crayon story again." My sister is the media specialist in an elementary school. Every now and then, she will tell my story to the students who visit her library. Forty-odd years ago, I sat in my first-grade classroom. The classroom's PA crackled to life, summoning me to the principal's office. The PRINCIPAL'S office! As I walked to the office, my six-year-old little life flashed before my eyes. What did I do? I was a shy kid. I did my best to blend into the background. I hated to be noticed or singled out. For me, being called to the principal's office was my worst nightmare come to life. My black and white saddle shoes scuffed the floor as I walked ever so slowly to the office. "Diane, the principal is not ready for you yet. Please have a seat," said the school secretary. I climbed up onto the leather sofa and sunk as low as I could into the cushion. I was praying that the cushion would swallow me whole. The intercom buzzed on the secretary's desk. "You can go in now," she smiled. I pushed open the heavy oak door. It was worse than I thought. Seated in front of the principal's desk were my parents. The real reason why they were there, I wouldn't learn until years later. My father walked straight over to me. He held a stack of my drawings. "Why do you only use a black crayon when you draw?" he asked. I couldn't speak. All I could do was shrug my boney shoulders. "Show me your desk," said my father. We returned to my classroom. It was recess time so all my classmates were out on the playground. I nervously pointed to my wooden desk. My father pulled out my crayon box. He dumped the contents into his hand. A single nub of a crayon rested in his palm -- it was black. Puzzled, my father asked, "Where are the rest of your crayons?" 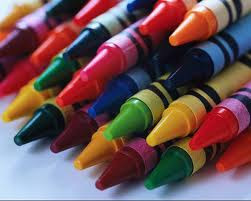 I quietly explained that I'd given all the other crayons to friends. I'd been sharing like my parents had taught me. My father let out a deep controlled breath, "You were sharing." I nodded my head. I looked at my father, then at the principal -- both their faces were red. The principal mumbled that I could join the rest of my classmates for recess. I waved goodbye to my parents. My mother waved back, but I couldn't get my father's attention; he was too busy glaring at the principal. I learned years later that my father's face was red due to anger and the principal's was red due to embarrassment. The principal, on seeing all my artwork done in black crayon, assumed that I had deep emotional issues. To him my crayon choice reflected my "dark and depressed nature." He had called my parents in to discuss "my problem" and to suggest some type of psychological counseling. I was too afraid to admit that I only had one crayon. I was too timid to ask for my "shared" crayons back. Because I didn't stand up for myself, others assumed the worst. That night, my father talked to me about "sharing and giving," and how the two are different. He also gave me a brand new box of crayons. He tapped the box and said, "These crayons are for you and you alone. I don't want you sharing or giving these crayons to anyone else, understand?" I clutched the new box and said, "Yes, Daddy." Today my sister tells her students, "Don't be afraid to ask a question. Don't be afraid to speak up. If you don't -- I just might make the wrong assumption. And that's not a good thing. Let me tell a story about my sister, when she was around your age. It revolves around an assumption and a black crayon...."
THank you for sharing that. What assumptions people make at times! Adults can be extremely good at jumping to conclusions and usually coming up with those conclusions based on incorrect assumptions. Unfortunately, a lot of those erroneous assumptions and conclusions are about kids! About 98.5% of the time (ok, I made up the statistic, but the concept is valid), kids are just being kids and have a perfectly logical and reasonable (at least to them) explanation for what they do....If only the grown-ups (?) would ask and listen! Good one, VM. I wish more teachers/administrators would pay attention to what the child is saying. Very touching, and so very relative to how we adults perceive kids based on how they look and act. Such a great story. I have to share it with my daughter who is 12 and shy. I try to teach her that people do make assumptions about her because she is so quiet, they think she's mean. My mother was called to the principal's office for the very same reason. The principal questioned me about my attitude, my thoughts. Finally my mother asked why my pictures were in black. "It's the only crayon left in the box when it gets to me." I sat on the last stool at the last table in the art room. My mother suggested they needed a smarter art teacher. This was in the '40's. Speaking up is a reasonable solution, but why is the teacher making assumptions instead of asking the child why she's not using a different crayon. That is a great reminder. Sharing and giving...how often that boundar gets blurred! Thank you so much. I needed to be reminded of this today. Wonderful!! Many years ago my daughter was in the tub playing with little barbies and mermaids but the black barbie was tossed out of the tub. I immediately was worried but asked why she wasn't playing with that one and she said.... "she sinks" hahaha!! all the other ones float and I was worried about racism!!? That taught me a lesson that 15 years later is as fresh and it was that day.